I’m from New Zealand so it’s possible I’ll get some of the towns and city names wrong that were covered on this poster run for NZ poetry posters. It was my sheer and extreme pleasure to be carrying with me Ben Brown poetry posters (The Door). I wouldn’t do this if I didn’t think Ben of Lyttelton had spade-loads of raw talent. 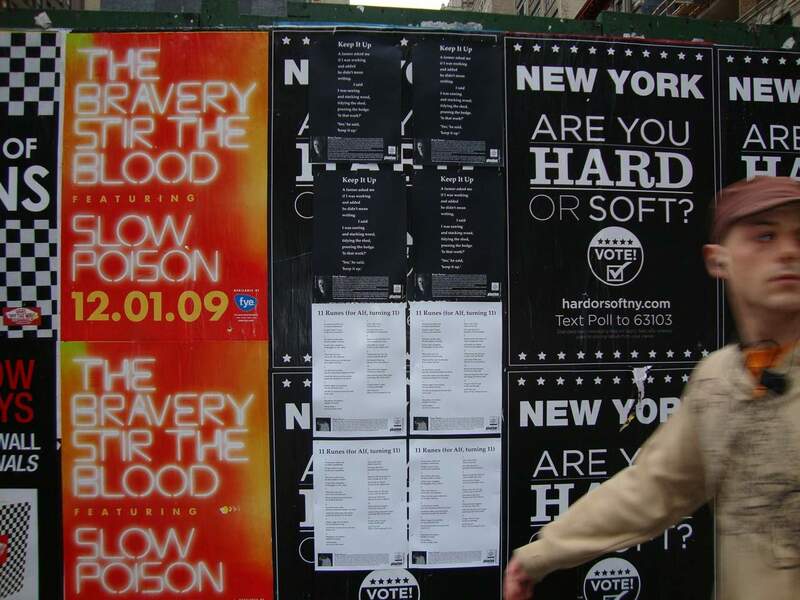 Every time I put a poem poster on a lamp-post or a notice board, I am aware that I have at least three effects: on the poet himself (I believe in him), on a potential audience (so nice to be reading a poem in the streets) and on myself (my blood flows). The week following this poster run we had a great meeting with Alice Quinn from the Poetry Society of America. Whilst in Manhattan for that meeting, I managed to get a few Brian Turner and Sam Hunt poetry posters up. These are very fine NZ poets. Let’s take this to the world, eh? Or do what we can.